The purpose of the Xcel program is to present recreational gymnasts the opportunity to participate in competition and/or provide former Junior Olympic competitive gymnasts the opportunity to continue competition without the intense time commitment. The goal of the Xcel program at Stars & Stripes is to challenge each and every athlete’s limits and abilities by providing enjoyable, yet challenging practices and competitions. The Xcel Gymnastics program along with Xcel Competitions is sanctioned by USA Gymnastics. USA Gymnastics is the governing body of gymnastics in the United States. USA Gymnastics wanted to provide an alternative to the Junior Olympic Program (which requires a tremendous amount of time commitment) where gymnasts could continue their participation in gymnastics and have the opportunity to compete, yet with limited time commitment in the gym. There are currently 5 levels (in the state of Michigan) in the Xcel program; Bronze, Silver, Gold, Platinum & Diamond. We put a great deal of pride into our Xcel Competitive Gymnastics program and strive to make it an excellent experience for every gymnast. The Stars & Stripes Competitive Staff is extremely passionate about their role in guiding children through their gymnastics training and helping them grow into strong, confident young ladies. Gymnastics is an excellent sport for children, and Stars & Stripes is a wonderful place to do it! What is the Xcel Program? Stars & Stripes introduced the Xcel program in the fall of 2006. The program has proven to be extremely successful. Over the past years we have had many state championship teams and individual state champions. The program is still fairly new to the state of Michigan and USA Gymnastics, however everyone has enjoyed the program immensely, therefore it is continuing to grow. It is a great experience for gymnasts who love the sport, and it is a great opportunity to be a part of a team. The Xcel program at Stars & Stripes is not a path to the Junior Olympic program, it is rather an entity of its’ own. Xcel gymnasts will have the opportunity to work their way up the levels within the Xcel program. 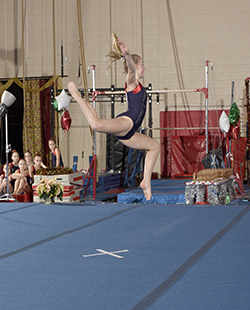 Xcel gymnasts (except Bronze) will compete in approximately 5 meets per year (meet season usually runs January through May), however a year round commitment to gymnastics is necessary. Competitions are all held in the state of Michigan. There are 5 levels in the USAG Xcel program; Bronze, Silver, Gold, Platinum & Diamond. All competing athletes must be USAG Athletic Members. Gymnasts will be evaluated and placed in a level where they will be successful. Form, technique & execution will be strongly evaluated. We are not looking for how many skills a gymnast can perform, rather how well they can perform their skills. The competitive season begins in January and ends with a state meet in May. Gymnasts will practice approximately 4-6 hours a week (depending on their level).